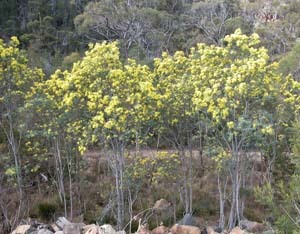 Acacia dealbata (silver wattle) is a very common tree or large shrub found in wet forests throughout Tasmania. It has silvery bipinnate leaves. 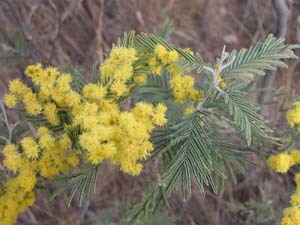 It is sometimes confused with black wattle (A. mearnsii), but tends to be larger and has silvery whitish leaves. 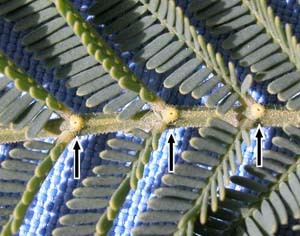 The glands are also distinctive (with one gland along the main leaf axis for each pair of pinnae, rather than two). It flowers earlier (August-mid September) than A. mearnsii.